Northwest Austin Real Estate - buy - sell - invest: Northwest Austin area Commuter rail: Pay more to go more? 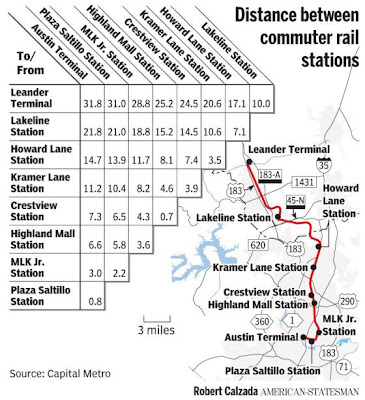 Northwest Austin area Commuter rail: Pay more to go more? The Map above shows distances between stops on the new Capital Metro Commuter Rail that will begin operating later this year. Basically, if you are getting on the commuter rail from the Leander or Lakeline Stations and riding it Downtown, the fare will be $1.50, which is almost twice as much as the proposed regular fare. This could potentially mean higher cost for residents of Cedar Park, Leander and Northwest Austin. The issue is that if someone gets on the Train in Leander but is not riding all the way downtown, would be riding a shorter distance. How will they track how far you are going so that you do not have to pay $1.50 for a few miles? They are not sure yet. It makes sense to me that a person riding the commuter train could purchase credits on a card and swipe the card at the station that they get on the train as well as the station they get off. Then it could be computed how many miles were traveled. Then they could have a flat fee for under a # of miles and another fee for over a # of miles. If there are not sufficient credits when they arrive additional credits would need to be purchased to exit the station. Train security could still swipe cards in a reader to make sure everyone has a "ticket". The subway in New York has a card system that every rider must use. There are no tickets and the cards are rechargeable. This way people that are taking advantage of the longer distances that the commuter rail provides, are contributing toward the cost of build and maintenance and the riders that ride a short distance are contributing accordingly. What do you think about this? Who will pay for older Austin homes to go green?